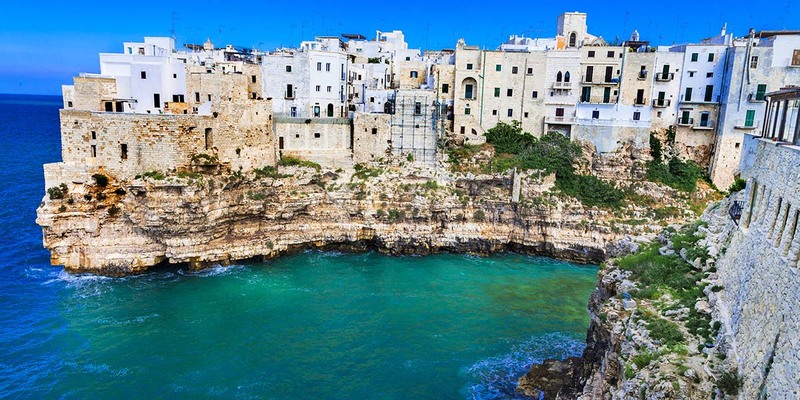 Apulia is often defined as the land of the wonders, a blend of art and culture, ancient customs and an impressive culinary tradition that is able to conquer the hearts of those who set foot in this territory. 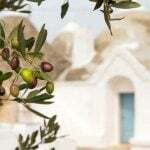 The landscape is defined by a smooth transition between the coast, dominated by limestone reliefs and paradise-like beaches, and the inland characterized by the presence of beautiful olive groves. The region is predominantly agricultural and it is famous around the world for its unique olive oil, high-quality wine, grains and citrus fruits. For many, Apulia is synonymous with olive trees and stone mills. Olive oil is considered the gold of the region, the result of great work and dedication of those who, with love and respect, cultivate and care for the olive trees. For the locals, every drop of olive oil is precious and envelops a unique and fresh flavor. Without a doubt, the most appreciated types of olive oil are the DOP varieties, present throughout the territory. 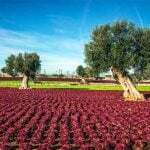 Among them, probably the most famous is Colline di Brindisi, a DOP extra virgin olive oil produced in the province of Brindisi. In the province of Foggia, the Dauno DOP extra virgin olive oil is the most appreciated. This olive oil, made from local olive varieties such as Garganica or Rotondella, has a distinctive sweet and harmonious taste and it pairs perfectly with fish and seafood appetizers. Terra di Bari and Terra D’Otranto are other famous DOP extra virgin olive oils produced from local olive varieties in the provinces of Lecce and Taranto, respectively in the province of Bari. The sun of the South also favors the cultivation of citrus fruits, and in Apulia, it is easy to come across citrus tree orchards that, especially during autumn and winter, impress with their sweet perfumes and vibrant colors. The citrus cultivation has increased above all in the area of Salento, mostly in the provinces of Lecce and Gallipoli, where the orchards occupy around 7000 acres of land. The most commonly cultivated citrus fruits are the oranges, with the hands down favorite being the Navelina. Tangerines are not particularly famous in Apulia, but the region has something better, the Clementine from the Gulf of Taranto, a unique hybrid that is characterized by a sweet and juicy pulp and the total absence of seeds. Lemons are easily found in the Gargano area and among the unique local varieties, we can mention the Femminiello, Monachello, and Interdonato. Apulia’s cuisine is made of ancient flavors and it respects the seasons. The traditional dishes are divided between the inland and the coastal areas, and they bare different influences that vary from one commune to another. One of the most popular appetizers in the region is acquasale, a dish that in the past was served as lunch to fishermen and peasants. The appetizer is prepared either with stale bread or with friselle, a typical type of stale bread, soaked in water and garnished with onion, tomatoes, salt, oregano, and extra virgin olive oil. Cold cuts are also a popular appetizer that usually includes capocollo di Martina Franca, a type of salami made exclusively with meat from a breed of pigs raised in the Valle d’Itria area. Prosciutto di Faeto and Faeto lard are other popular cold cuts served as appetizers, especially in the province of Foggia. In Foggia, a typical cold cut is muschiska, lamb, goat or veal meat cured for 20 days and seasoned with hot peppers, fennel seeds, salt, and garlic. In some areas, this type of meat is grilled or cooked and served as the main course, accompanied by vegetables. As appetizers, we can also mention a wide variety of cheeses. Among them, probably the most appreciated is caciocavallo podolico, a type of semi-hard cheese made from milk produced by a rare breed of cow bred almost exclusively in the Gargano area. 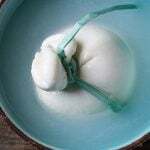 The cheese is typically aged in caves or wells and it has a spicy taste of wild herbs. 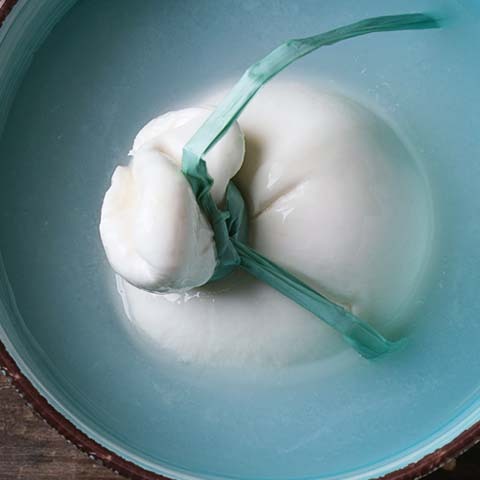 Pallone di Gravina is another type of semi-hard cheese typical from Apulia, made from raw bovine milk. Originally from Gravina but also produced in Murgia and Basilicata, the cheese has a round shape and is usually produced between January and March. The cheese is consumed either fresh or aged for up to four months, time in which it assumes a slight spicy note. 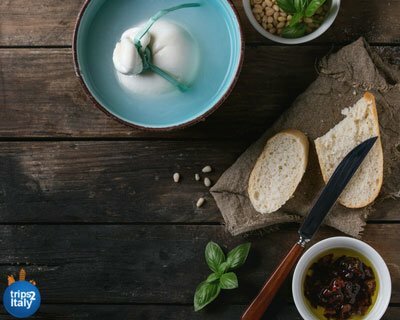 In the province of Bari, the most famous cheese is without a doubt, burrata d’Andria, a soft and fresh cheese somewhat similar to mozzarella but with a soft, buttery consistency. Cacioricotta is another type of cheese famous throughout the Apulia region. Usually made from goat or sheep milk, cacioricotta is consumed fresh or aged for about three months to develop a saltier taste. The cheese is produced in all seasons but the best time to taste it is in late spring or early summer. Lastly, a cheese worth mentioning is canestrato pugliese, which is typical of the areas of Foggia and Bari and obtained from whole milk produced by a specific breed of sheep that is fed exclusively with fresh herbs. The cheese is aged for at least 90 days and consumed with fruits and vegetables, or it is used to garnish pasta dishes or salads. The cold cuts are usually served with bread or taralli. In Apulia, bread has ancient traditions and there are many different types of bread that must be tasted throughout the region. In the province of Foggia, pane di Monte Sant’Angelo is probably the most famous, while Altamura in the province of Bari is another area renowned for its exquisite bread. Taralli, on the other hand, is a simple product originally prepared by peasants and served with a glass of wine. The texture of taralli is similar to the breadstick and, according to tradition, they were made from leftover bread dough, enriched with white wine and water. Today, they represent the perfect finger food that pairs well with all types of cold cuts and cheeses. Apart from these cold appetizers, peperoncini sott’olio, which are round hot peppers filled with tuna and capers, or with beans with herbs, usually served cold and seasoned with abundant extra virgin olive oil are a real favorite. The agricultural tradition of the region led to dishes inspired by local products. 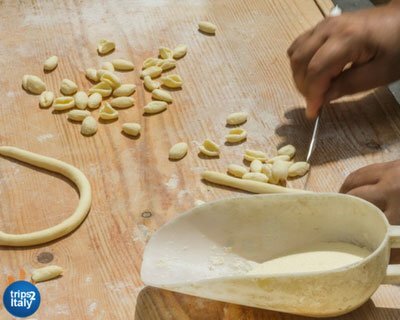 Apulian people have a special love for beans, which they use to make soups in winter and salads during the summer. Beans are also added to many pasta dishes or transformed in purees. The locals also make use of many wild vegetables, such as turnip leaves, chicory, and dandelion that are first boiled then seasoned with olive oil and served alone or as part of a dish. Soups vary a lot between the coastal regions and the inland areas. In the coastal regions, fish soups are the first courses of choice, the most famous being the zuppa gallipolina and zuppa brindisina, that require different preparations and that are made of different types of fish. In Salento area, scapece salentina is a delicious type of soup made with blue fish, saffron, breadcrumbs, and mint, while the Bari area is famous for octopus skewers and octopus with olives stew. Inland areas, on the other hand, boast typical soups linked to the peasant tradition, made with poor ingredients but that have heavenly tastes. Among them, cialledda is one of the most popular, made with stale bread, tomatoes, onions, oregano, and parsley. In the province of Bari, a popular dish is the minestra verde, literally a green soup made with cabbage, carrots, celery, cauliflower, chicory and other leafy vegetables, boiled in beef broth and served with boiled beef. 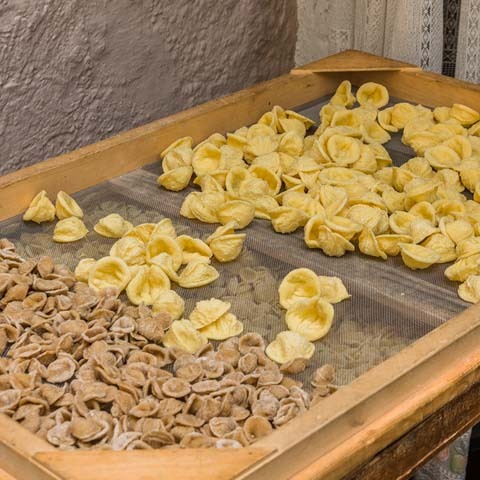 The Apulia region also boasts an impressive variety of types of pasta. 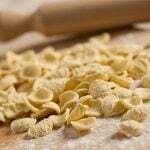 Among them, the most beloved by the locals are the orecchiette, a type of short pasta shaped like a small ear. 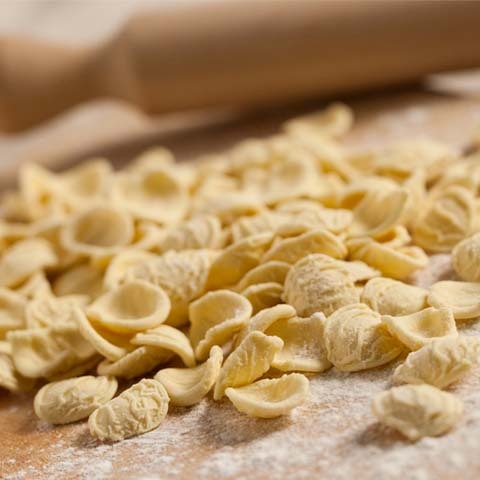 Orecchiette con cime di rapa is, without a doubt, the signature dish of the region. This exquisite first course is made with the tops of the turnip plants before flowering that are sautéed with garlic, hot peppers, and extra virgin olive oil, then added to the cooked orecchiette. Cavatelli is another type of short pasta, usually served with mussels. Another delicious pasta dish is timballi, made of macaroni and stuffed with meatballs, mozzarella, salami, cuttlefish or vegetables. Long pasta, such as spaghetti, troccoli or vermicelli, is often accompanied by mussels and crustaceans such as clams or shrimp, although in the Foggia area they are usually served with lamb ragù or baked in the oven with mozzarella, meatballs, and aubergines. Another popular first course in Apulia is rice with mussels and potatoes, a traditional dish in the province of Bari but prepared almost anywhere in the region. Similar to the first courses, the main courses differ between the coastal areas and the inland. As you could expect, the coastal areas offer fish and seafood dishes made with the exquisite fish of the region. Among them, one of the tastiest is cozze ripiene. The mussels are stuffed with a dough made of softened bread crumbs, chopped parsley, pecorino, and eggs, then cooked with tomatoes and garlic. The peculiarity of the dish is that the stuffed mussels are closed in their shell, while their flavor is truly heavenly. Gamberoni al guazzetto is another appetizing main course that exalts the simplicity of the Apulian cuisine. The dish is made with prawns cooked in a sauce made of tomatoes, garlic, and brandy, and usually served with a generous amount of bread. Apulian baccalà is another fish-based main course, popular in the region especially during winter. Apart from these dishes, in the coastal areas, locals prepare a wide variety of broiled or grilled fish. Probably one of the best recipes is the fish with olives that is baked in the oven and served with bread or potatoes. In the inland areas of Apulia, meat is the protagonist of the main dishes and it is prepared in countless ways that vary from stews to grilled meat, to skewers or roast. Among all dishes, braciole pugliesi is one that stands out. These veal rolls are stuffed with parmesan cheese, then slowly cooked in tomato sauce. Alternatively, they can be baked in the oven and stuffed with a wide variety of ingredients, including traditional salami, cheeses, and vegetables. In some areas, the braciole are made with horse meat instead of veal. The bombette are another popular main dish in Apulia, above all in the Murgia and Bari areas. These meat rolls are usually made with pork and stuffed with caciocavallo or scamorza cheese. The rolls are then wrapped in bacon and placed on skewers, then grilled. Because of their tiny dimensions, these rolls are also a popular street food. An exquisite main dish popular in almost all areas of Apulia is torcinelli, a unique type of sausage made of long slices of lamb or kid lung, heart, liver, and kidney, which are wrapped in the animal’s gut. The sausages are usually grilled but they can be cooked in many ways, including in ragù. Apulia also boasts exquisite vegetarian dishes. One of them is parmigiana di melanzane. The dish is made of aubergines, scamorza cheese, parmesan, and basil, then arranged as lasagna and baked in tomato sauce. The recipe typically includes mortadella as well, but it can easily be excluded for a vegetarian version. This symbolic dish of the Mediterranean cuisine is a classic of the Southern Italy, and it doesn’t have a fixed recipe. 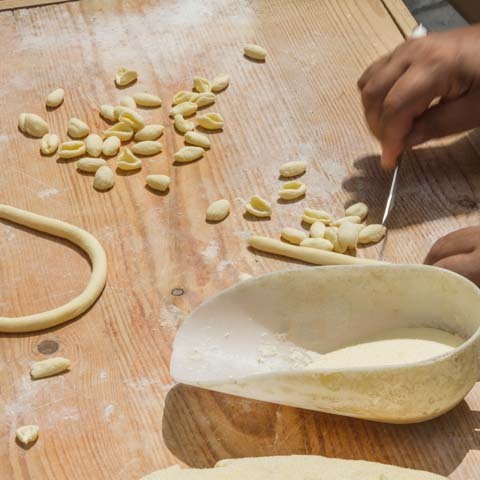 In fact, in Apulia each family interprets the recipe and adjusts it according to personal preferences. Lastly, the bread dumplings, called polpette di pane in the local language, are a “poor” dish of the peasant tradition that uses bread and old cheese to create an exquisite main course. The dumplings are usually cooked in tomato sauce, although they can also be baked or fried. In Apulia, side dishes are usually “poor,” made with simple ingredients that can perfectly exalt the flavor of the main courses. Pomodori arraganati is one of the most popular side dishes in the Apulian gastronomic tradition. The dish is made of tomatoes that are usually stuffed with bread crumbs, anchovies, capers and basil, then baked in the oven and served with fish dishes. Ncapriata is one of the sides of choice for the meat dishes. This side is made with fava beans that are slowly cooked in salted water with garlic and hot peppers. Depending on the preferences, they can be served as a puree or whole beans, and are usually accompanied by sautéed turnip leaves or chicory. Apart from these dishes, there are wide varieties of vegetable dishes that include grilled or sautéed vegetables, purees of vegetables or beans, and baked vegetables. 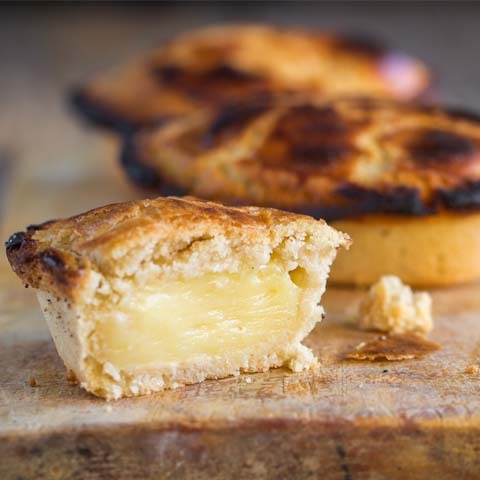 Apulia boasts numerous delicious desserts that can complete any meal. Just as the above-mentioned dishes, Apulian desserts have their roots deepened in the local tradition, and some of these sweets are rarely available all year round. Among the most popular desserts, the zeppole are loved by almost everyone. This sweet is made from a dough similar to the French éclair, but they have a round shape similar to taralli. The zeppole are either baked or fried, filled with custard and sour cherries, then sprinkled with velvet sugar. This sweet is typical to the St. Joseph celebration, but some pastries make it all year long. 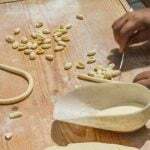 Traditional in the Christmas season, especially in the province of Foggia, the cartellate is another exquisite dessert. This sweet treat is made of flour, white wine, and sugar. The dough is shaped as a ribbon then swirled into a spiral. 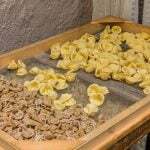 The cartellate are fried, covered in honey or dry fruits, then served accompanied by a glass of sweet white wine. Biscotti di Ceglie is a type of biscuit made of almond flour that is filled with sour cherry marmalade. The flavor is exquisite and can follow any type of main course. In the Gargano area, ostie ripiene is another type of dessert that can literally delight everyone. This sweet is made of two thin sheets of wafer stuffed with honey and almonds. 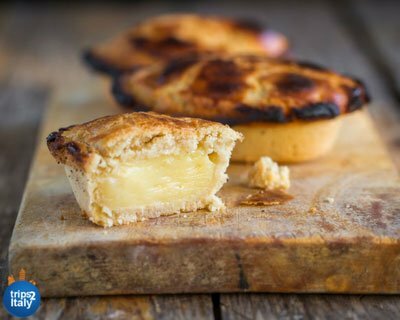 Lastly, pasticciotto is a sweet typical in the Salento region, made of pastry and filled with custard and sour cherries or chocolate. Without a doubt, the center of the street food in Apulia is Bari and the province. There are countless delicacies to taste on the go in this area. 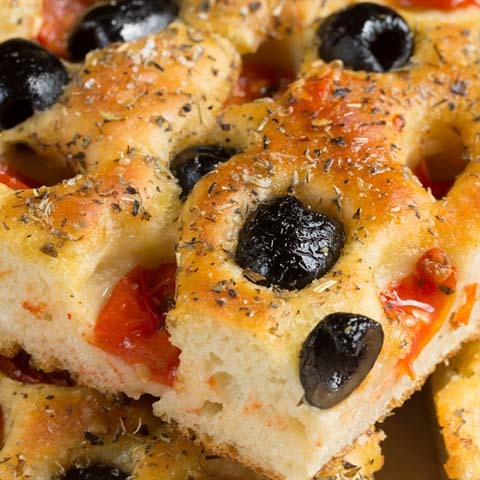 Focaccia barese is certainly the most popular type of street food. The peculiarity of this type of flat bread is the presence of the potatoes in the dough. 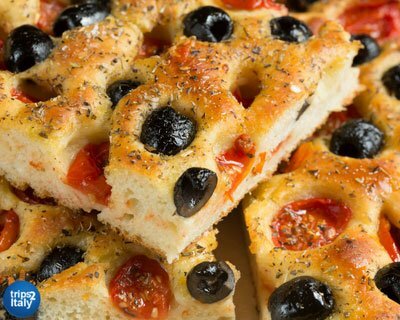 The focaccia is baked in round pans that are greased with olive oil, and it can have numerous toppings. The original focaccia barese was made exclusively with tomatoes and olives, but today it is easy to find it garnished with potatoes and rosemary, onions, or anchovies. Popular in many areas throughout the region are the sgagliozze, slices of polenta that are fried in boiling oil and served in paper bags or cones. A sweet street food in Bari and the province are the popizze, fried dough balls covered with velvet sugar. In the rest of the region, pettole are another street food made of the same dough that is fried in a more elongated shape and usually served with vincotto. Apart from these, panzerotti ripieni and puccia are other popular street foods throughout the region. Apulia is characterized by both hilly and plain areas, while the sun, air, climate and the soil are perfect for the proper development of grape vines. As such, the region boasts over 30 DOC and DOCG wines that can accompany a relaxing evening or a delicious meal. All the wines in the region are produced according to the ancient tradition of winemaking and maintaining unaltered the cultivation techniques. Among the white wines, one of the most popular is Moscato di Trani. Made from white Muscat grapes, this wine is characterized by a pleasantly sweet flavor, and it can pair wonderfully with any of the traditional desserts. Fiano di Puglia is another popular white wine among the locals. Characterized by a dry crisp flavor, this wine pairs well with fish and vegetables. Other popular white wines are Locorotondo and Gravina Bianco. Apulia is certainly most famous for its red wines, and among them, we can mention Primitivo di Manduria as one of the most popular. This wine has a pleasing and harmonious flavor, while its aroma is particularly light. When aged, the color of this wine is almost purple and it has a velvety flavor. Negroamaro is another popular red, characterized by a fruity flavor and a delicate tobacco aroma. Its taste is somehow similar to Nero di Troia, another exquisite Apulian wine. Lastly, we can mention Castel del Monte Aglianico, a red wine that pairs perfectly with the various cold cuts and cheeses that are typically served as appetizers. "Ciao Tommaso and Giulia, we have a wonderful trip. 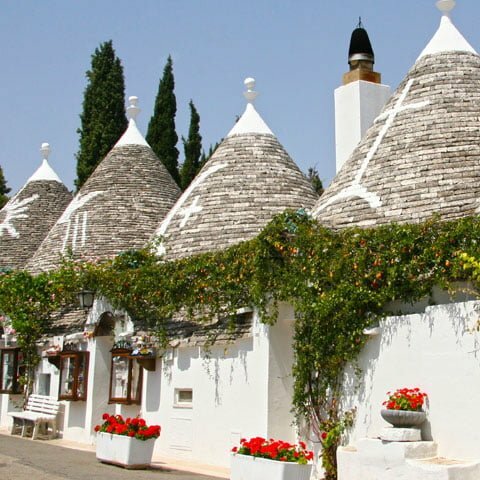 From Alberobello, Pade Pio, Monte S.Angelo, Sorrento, Capri, Amalfi, Ravello and more to see and do, you have plan everything." Dear Ana and Tommasso, We want to thank you for the wonderful customized trip to Sicily. It was a trip of a lifetime and a dream come true. Everything about the trip was perfect, including having Tommasso along with us. This was definitely a trip we will never forget.....it was perfect. 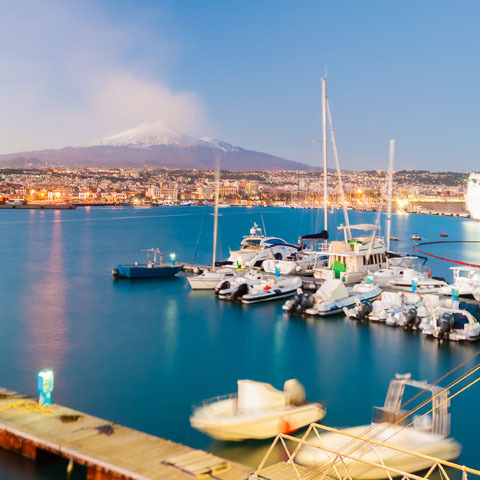 TRIPS2ITALY is great and we would definitely recommend your agency to anyone wanting to see beautiful Italy and Sicily.